Like many of us, David Rosen exudes bike passion when you talk to him about a ride or a bike. He owns and operates Sage Cycles in Portland, Oregon. And though it may not be obvious, he stays awake at night thinking about the details of his bike designs that he fabricates right here in the US of American-sourced titanium. 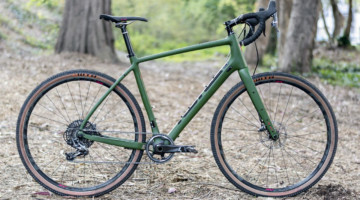 We reviewed the Sage Cycles PDXCX ‘cross bike a couple of years ago back in print issue 25 as a typical ‘cross racing design and an expression of Rosen’s thoughts about how the bike should be used. The Barlow is his latest design with the gravel rider and racer in mind. 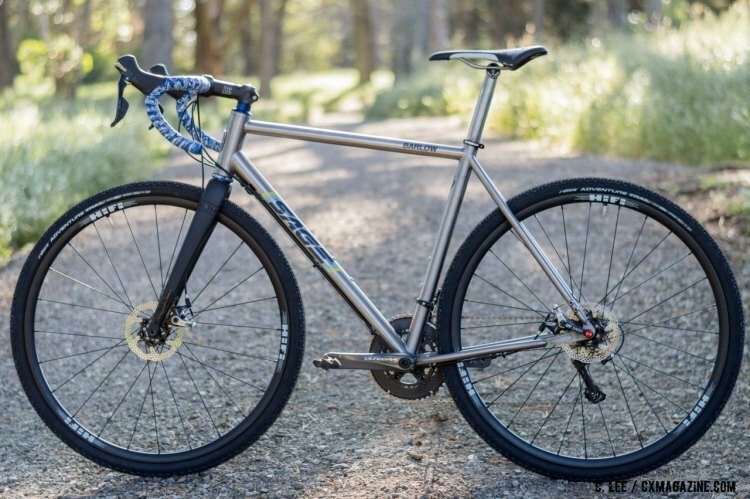 The Barlow has the latest technologies in an up-to-the-minute titanium bike that’s designed to be at home on the road less travelled. Our 56cm review sample of the Sage Barlow is beautifully TIG welded of 3 Al/2.5 V titanium alloy with a geometry that mixes elements from a modern ‘cross bike, like 42.5cm chainstays and a 7.0cm bottom bracket drop, with a road racing bike-like long 58cm top tube to facilitate a lower position on the bike. The long top tube combined with the 72.5 head tube angle yields a long 617mm front center. The Barlow has a 142 x 12mm thru-axle rear end and is outfitted for flat mount disc brakes with a minimum rotor size of 140mm. The Lynsky-made 6 Al/4 V right chainstay truss is engraved with the Sage owl logo and is machined on the backside to hide the electronic shift wire, a detail Rosen asked for in the stays’ manufacture. The truss is welded to a standard 68mm threaded bottom bracket shell, also a detail that Rosen toiled over given the variety of choices out there. He says in the end there was no advantage for him to use a new design. 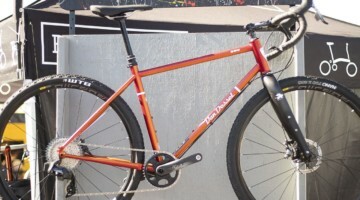 The Barlow does have a big 44mm diameter headtube to accommodate a tapered fork steerer. It’s a nice 152mm long on our 56cm size frame allowing me get the bar to the proper height without a tall stack of spacers. All control lines run externally and neatly along the downtube with Rosen’s patent pending Cable Clip System (CCS) with barrel adjusters for the shift cables. 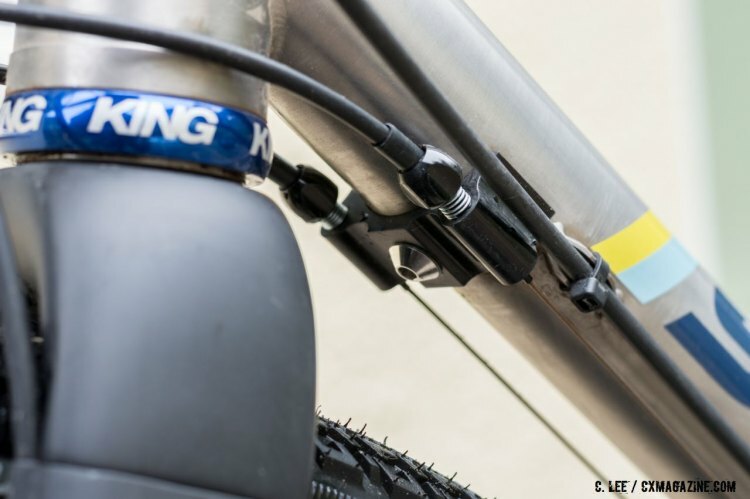 If the rider elects to use an electronic shifting system that requires wires, then the CCS unbolts from the downtube and the bolt hole serves as the electronic control wire port. Pretty smart. 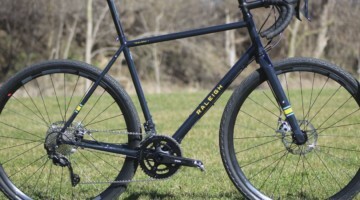 Brazed on fixtures are provided on the downtube for the externally routed rear brake line, and of course there are twin bottle cage mounts as well as an additional bottle mount on the down tube’s underside and bosses for a rear fender and rack. Unfortunately the included Enve 12mm thru axle GRD fork does not have provisions for a rack, but does have a proprietary snap-on fender. The full carbon, tapered GRD fork is set up for flat mount brakes, aesthetically matching the frame. The Sage website allows buyers to configure bikes with parts a la carte and calculates the final price accordingly. Then buyers can have the bike sent to a Sage dealer or directly to them. Rosen is slowly building a network of dealers, first in Oregon and now in California, to better serve his customers. Our review bike is equipped with an Ultegra 6800 11 speed mechanical drivetrain, with 50/34t chainrings and an 11-32 cassette. The brakes are flat-mount specific TRP Spyre aluminum arm mechanical calipers with 140mm rotors on both the front and rear. Rosen specifies a matching titanium Lynskey seatpost with a laser etched Sage Cycles logo. 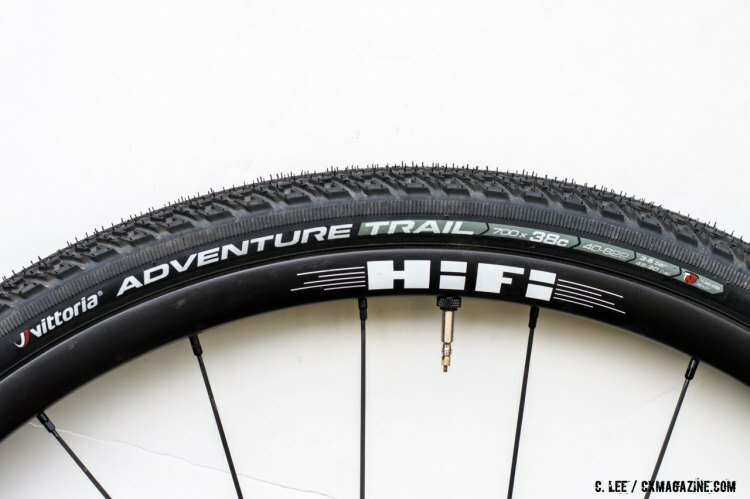 An uncommon, but nice spec is the HiFi Wheels Session MTB carbon wheelset, tubeless ready with the new Vittoria Adventure trail 38mm TNT gravel tires. The TNT tires set up easily and reliably on the Session wheels. 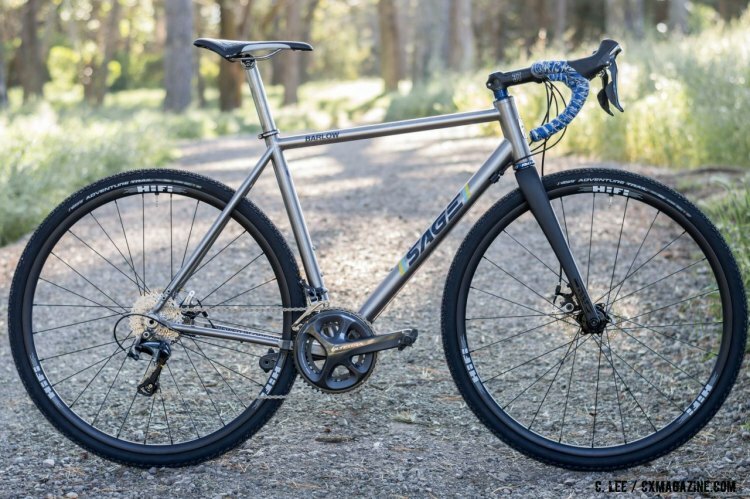 If you want a titanium road bike for all surfaces, David Rosen has thought through all the details for you on the Sage Barlow. 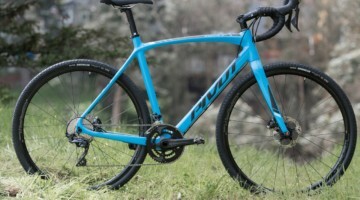 It contains all the modern features of a gravel bike and with its thru axles and flat mounts, seems future-proof (which we know is no real guarantee these days). We have been riding the Sage Barlow on long mixed-terrain excursions during the offseason and we will have a full review coming up in Issue 33! Subscribe today and don’t miss the full story! cyclocross Thank you for the very cool write up! Looking forward to reading issue #33 when it hits newsstands!